Oh my, what can I say about this website? I am simply in LOVE with FMF (Free Money Finance)! He is my blogging idol. I would like my blog to grow up and be FMF one day. If you really want the low-down on your personal financial situation, I would suggest that you read this blog. I've followed it since I discovered it in 2008 and it's always good. Good information, good writing and good advice. If you are a blogger wishing to gain a large following, this article series will truly help you. I know it helped me. I think what I really like about this blog is the hard work FMF puts into the blog's archive to make it easy to find any topic dealing with finance. Also, I appreciate the no nonsense, easy reading style the author created. Often at the end of his posts, he gives a short of list of other posts that are on the same topic and that the reader may be interested in. I'm thinking of adopting that technique in Telecommuting Millionaire? Blog because I find this so very helpful. Visit Free Money Finance. You will not be sorry. Your Six Figure Income - Become a High-Income Earner, like tomorrow! I've studied this book for a couple of years now and I would invite ALL PEOPLE (not just women) to read this book! I actually read this book, studied it, and tried to apply it to my life. It really helped me work on my "mental" blocks in truly valuing my skills, my experience and my knowledge -- and USING them. The result of my reading this book has been a better salary, a better valuation of what I bring to a company (whether it be an employer or client), a new business that I've recently started and the gumption to actually follow my passion and really focus on my writing career! Here is what I learned from this book. Our state of mind, more than anything, determines our level of financial success. The traits of 6-figure "high income earners"
This book has really helped me step into my personal power and claim it! It's one of the catalysts that helped me to rejuvenate this blog and begin spreading what I know so that you guys can benefit from this type of information too. The book is not expensive at around $12.00 and it is well worth your money! Check out *Secrets of Six Figure Women: Surprising Strategies to Up Your Earnings and Change Your Life by Barbara Stanny -- you will not be disappointed. I want every one of you to buy and study this book because I want to be surrounded by "high-income earners"-- because, I've always wanted powerful and influential friends! *Disclosure: The links to this book is an affiliate link. Xerox is the coolest company that I have discovered so far in helping people who want to telecommute for a solid company. They are so cool, that they have a website totally devoted to positions at Xerox that one can do from home. So cool. They even have jobs that are well suited for our men and women who have performed military service in the past. They call it. HEROES AT HOME! Through our Heroes@Home program, we hire qualified veterans and military spouses for at-home employment opportunities. In the past year, we've had job placements for customer care agents, image processors, data analysts, help desk specialists, systems developers, leadership roles and many other positions. This is one of the best work-at-home/telecommuting job hunting webpages. Enjoy and happy hunting. Hey you, don't let one person's negative comment, opinion, observation dictate your life's path. DON'T DO IT! I can warn you about this because I took this very dubious path. I let one person's negative comment change the trajectory of my life. It caused me to suspend my writing career. That one negative comment made me reject my most beloved vocation. My calling. What I'm saying to you is to be aware of the criticism, the negative comments said on the fly, the opinions that come your way. Be aware of them--even listen to them--but take them with a grain of salt and don't let them get in the way of your work, your joy, your dreams. In fact, I would strongly suggest that for every negative comment you encounter, be even more aware of positive critiques, comments and opinions you receive at the same time. I said that during the time you receive negative comments and criticisms--you will usually receive positive and encouraging comments at the very same time. It makes me so angry (though I am infinitely guilty of this as well) when someone gives more credence to the negative comments than the positive comments they receive. In many situations, we (because I'm including myself in this practice) can have 10 different people giving us 10 positive reviews and instead of happily accepting that we have done an excellent job because we have gotten acknowledgement from the majority of our audience--we focus on that one negative comment or review. Why do we do this? Why would one negative review cancel out 10 good/encouraging opinions? How horrible are we being to those 10 people that liked/enjoyed our work or creations? Why would we think those 10 opinions invalid suddenly? Why would we give more weight to the one negative person, the one negative review? That's crazy! But we do it all the time. Let me explain how this practice has hampered MY life. During my college years, I won several awards for writing. I gained over $5,000 in scholarships that helped me in afford college. I was on my way to becoming a published author, which was my next step. In my Junior year, I decided to take a Creative Writing course on another college campus. In the Creative Writing course there were 15 students and each session focused on the work of one student. We were to offer a story, everyone had to read it and then we were discussed the stories; providing constructive criticism, opinions or accolades. When my turn came I receive many accolades from about 10 of my classmates. Three had some pretty good constructive criticism that I thought would make my story stronger. One did not like my story at all but enjoyed my writing style. But one guy (and I'll never forget him) let me know that he thought I was a poor writer. He was British. He was tall. He was older than most of the class. Please notice how after many years I still remember details about him? You can ask me what the other people in the class looked like and to save my life I could never tell you. But I could, to this very day, tell you what this guy looked like, what he sounded like and, unfortunately, what he said. It didn't matter that 13 other people thought my story was not only good, but valid. That my writing style was very readable--and they told me so. It did not matter that I got an A in that class. It did not matter than I had won monetary awards for this very same piece of work. All that mattered was that this guy said that I could not write and that my creation was a piece of junk in his eyes. I never took another creative writing class again. It was an entire decade before I let anyone else see a any piece of fiction I wrote. Did you see what I did? 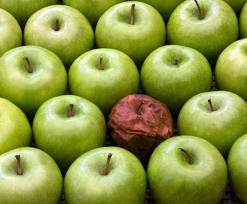 I let one bad apple spoil the whole bunch! I let one negative opinion dictate my life's path. Who knows what I may have achieved if I hadn't let negativity shut me down. If I didn't let the doubt that was voiced at me turn into a ball of rejection and fear inside my mind. Who knows, I might have had a dozen published novels at this time. I might have made a living writing, instead of simply being content doing it as my side vocation, my hobby of sorts. When I think how my life could have been considerably different if I would have let the several dozen positive opinions color my world, instead of focusing on the one negative opinion--I just get sick. We do this over and over to ourselves. This bad habit that we exercise is so extreme, so pervasive in our society, that we have beauty product commercials seriously examining this psychological issue! Don't believe me? Watch this commercial/documentary by Dove Soap. Seriously, it expresses exactly our problems with ourselves. Learn, my dears, from my cautionary tale. Look at the ratio of comments, opinions and criticism with an eye toward truth. Honor people! If you have 10 positive opinions/comments, don't let one negative opinion out rank the 10 good ones. Disregarding those 10 people's opinion is a terrible thing to do. Those 10 people in my Creative Writing class deserved better consideration from me, deserved to be honored for their energy, their encouragement and their opinion. In essence, I was saying that their opinion did not matter and that was very, very wrong of me and I apologize to those people for my neglect of them. So, in the future--I beg of you--if you receive 100 good reviews and 3 bad ones . . . don't focus on the bad reviews! Give energy in the ratio that you receive. Seriously! If you have 100 reviews and 3 are bad, then you are allowed to spend only 3% of your time feeling bad about those reviews. Three percent, that is all. If you have 10 reviews and receive 1 bad one, then you are only allowed to use 10% of your time worried about that review, that's it! Then move on. You are not to shut down. You are not to stop doing what you love. You are not ALLOWED to do anything but keep going. This should apply to all things in life. I should have been ashamed of myself, disregarding 10 good reviews/opinions/comments like they come lightly or a dime-a-dozen. Good reviews are very, very hard to get and I should have cherished them much, much more than did back then. The lesson I learned from this episode of my life is . . . take the bull by the horns! Live life against all adversity--especially, the doubts in your head. It's the only way to success. And YOU are going to be successful, you have to be. I'm counting on you. After all, I've always wanted powerful and influential friends! Do you watch HGTV and DIY Network 12 hours a day? Do you love to clean and decorate living spaces? Do you hang out at Lowe's and HomeDepot? Do you have Real Estate Agent/Broker friends? Why not combine these things and create quick money staging and cleaning houses for sale? The most successful Home Stagers know that the goal is to de-personalize a property so that visitors can envision themselves "living" there - yet, at the same time, make the home attractive, clean and homey. A seemly impossible task. But it's done all the time by professionals that love to rearrange furnishings and household items to make the best impression -- people like you. Your eye for design. Your professional assessment. Your creative & decorative touch can earn the seller thousands of dollars more and speed up the selling process for a home on the market. This is important work! Do you realize that for $100 spent to stage a home, the home seller/real estate agent can realize $7,000 more on the asking price of the home? That's a pretty nice return! And you can make that happen. So, what do Home Stagers do exactly? 3. They know the proper place to put furniture for better sight-lines, traffic flow and profit gain for the seller and real estate agent. 4. Curb appeal and landscaping that draws the visitors and would-be buyer into the property. 5. Eliminating clutter and de-personalizing the home to make it more appealing to the buyer. 7 Things you need to do to begin making money as a "home stager"
Read every article you can find on "Rules for Staging Homes", study the books and articles almost religiously. You know you love having the excuse to dig deep into the topic of home improvement and home design -- so enjoy it. You now have a viable excuse to spend hours and hours on the topic. 2. Show them what you can do! Put together a portfolio of homes you staged. How do you get a portfolio set up, easy. Ask your friends and relatives if you can borrow some of their rooms for a weekend, stage their room. Take before and after photos. Have those friends write a testimonial up for you. Now you have a portfolio of work! 3. Put your portfolio online. Quick tip: You don't have to create a website. Social media sites are wonderful! You can use Pinterest or Facebook to feature your work. Easy, quick and free! Talk to other Home Stagers and Real Estate Agents outside of your area. Talk to them about the best practices of the business, rates that they've charged, marketing tips, etc. There is nothing like good advice to really springboard your business. Make sure your business card design reflects what you can do for your client -- keep them simple, clean, appealing but elegant and modern. You can get professional business cards for $20 bucks. Talk to your real estate friends, family and acquaintances letting them know that you are available to help them. These will be your first clients. Talk up your expertise, let them know you can help them make more profits. 7. Get even more business. Go to open houses and place your business card there when you encounter an empty house that needs staging. Talk to the Real Estate Agent (if they are not talking to potential buyers). Understand that this little side-line business can develop into a full-fledged business that would require much more investment of time and resources. I would suggest that if this is the type of work you would like to do full-time that you should research the possibility to developing a full-fledged business plan and develop this idea into something bigger. Most Home Stagers do their work beginning in the range of $50 an hour. Many also provide cleaning service as well. When people discuss your rate, understand that for $100 you are charging a client in home staging improvements, they will/can realize $7,000 or more on the selling price. You may wish to read this book.